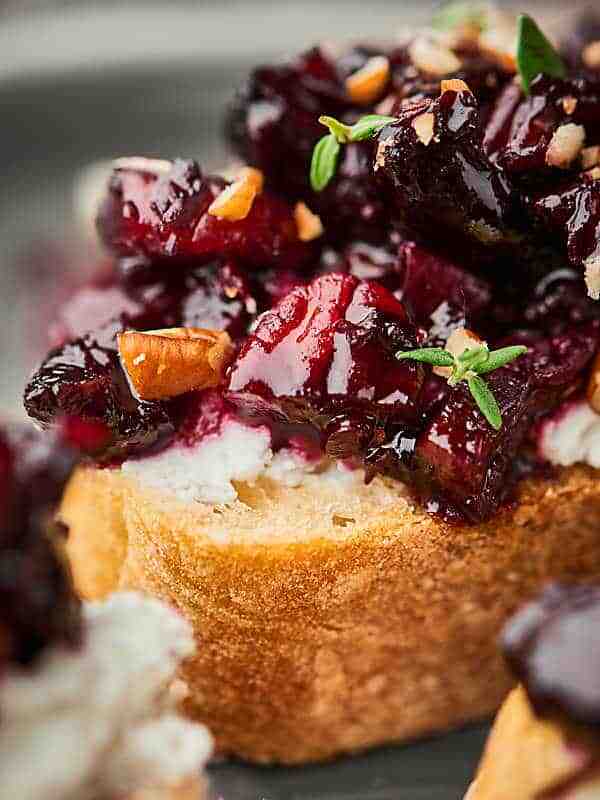 This Cherry Bruschetta Recipe is sponsored by our amazing friends at Barefoot Wine & Bubbly. We seriously <3 them. Four words: Cherry. Bruschetta. Goat Cheese. You guys. This Cherry Bruschetta is like a holiday party in your mouth. One of my favorite things about the holiday season are the parties and one of my favorite things about parties is the food – more specifically the snacks/apps/desserts. 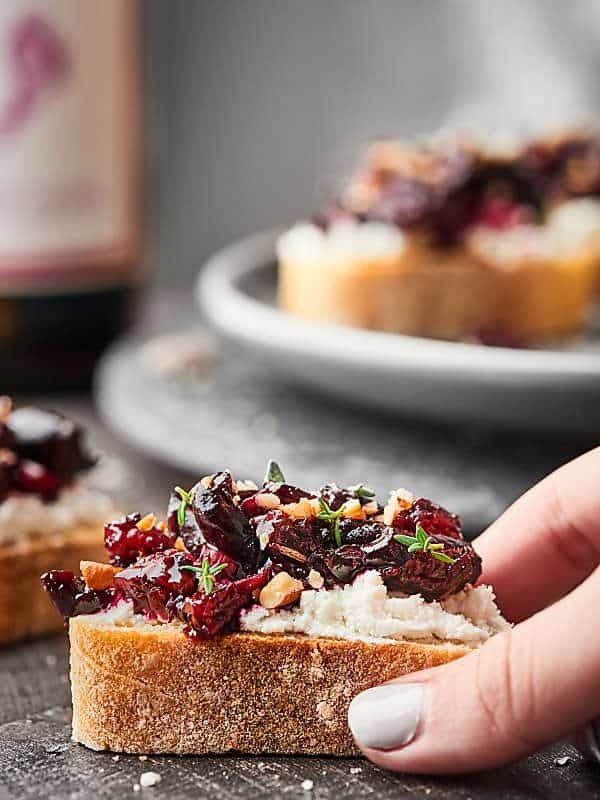 Today, I have for you what’s going to be your latest go-to holiday appetizer: Cherry Bruschetta. Perfectly enough, it fits all my criteria for holiday recipes: cozy, easy, and delicious! If you’ve ever met me, I’ve probably expressed my love for all things goat cheese and bruschetta at least once, but probably twice. 😉 During the summer months, I LOVE going to our local pub, sitting out on the patio to enjoy their goat cheese and cherry tomato bruschetta. Now that tomato season is over, I’ve been needing to figure out a new twist on my beloved tomato bruschetta. Once I saw “dark cherry”, I knew exactly what I wanted to make. Start by melting butter in a large skillet. Once melted, stir in finely minced onions. 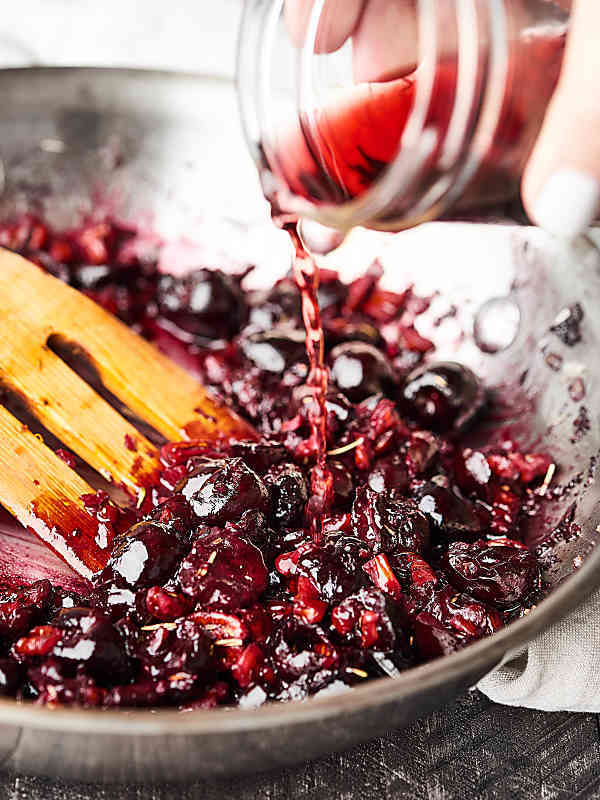 Let ’em cook until they’re nice and soft and then you’ll stir in sweet dark cherries (I used frozen that I then thawed and drained), pecans for some crunch, salt, and dried thyme and rosemary – hellllooooo fall flavors. This mixture cooks down for a bit and after a few minutes you’ll stir in the Barefoot Pinot Noir and granulated sugar. Cook a few more minutes and you’re almost done with the BEST fall appetizer. You’ll remove the mixture from the heat, slather some goat cheese onto a baguette piece, and load on the cherry mixture. The result is amazing. 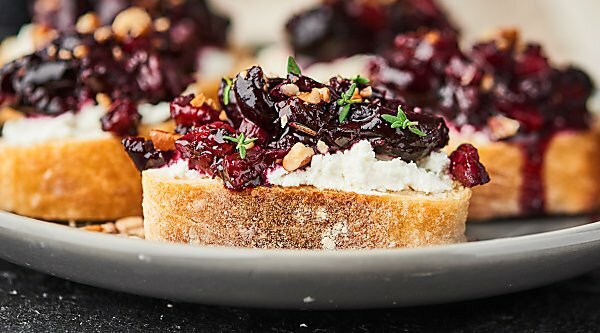 Super chewy bread, smothered in tangy creamy goat cheese, and topped with a sweet, crunchy, holiday flavored cherry compote. You guys. Because of the cozy red wine and the thyme and rosemary, I’m telling you, it’s a holiday party in your mouth. What are your fave holiday flavors? Mine are rosemary and thyme! Show Me the Yummy! Add the onions and cook about 2 minutes, or until they start to soften. Add cherries, pecans, and spices and stir everything to combine. 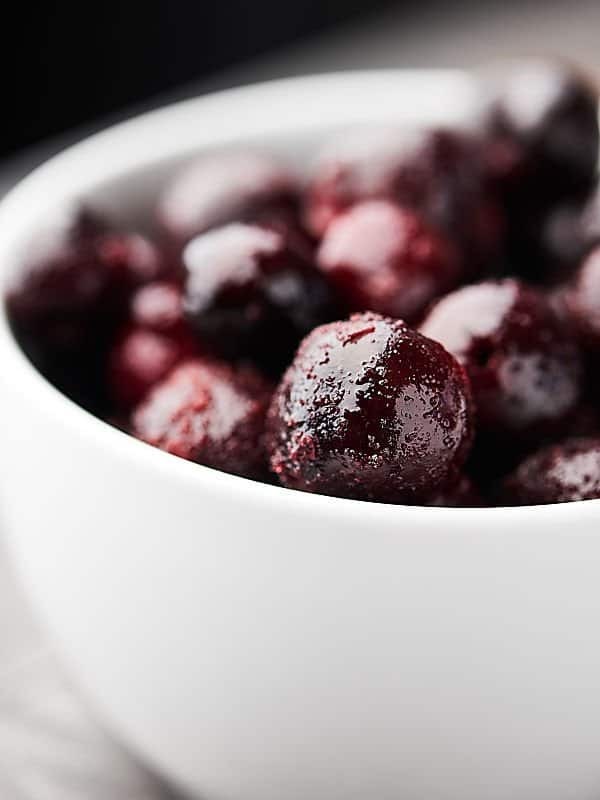 Turn the heat down to medium and cook until the cherries are soft, about 4 minutes, stirring occasionally. Breaking up some of the cherries as you go. Stir in the wine and sugar. Simmer until the cherries the liquid cooks down to a syrupy texture, about 4 minutes. 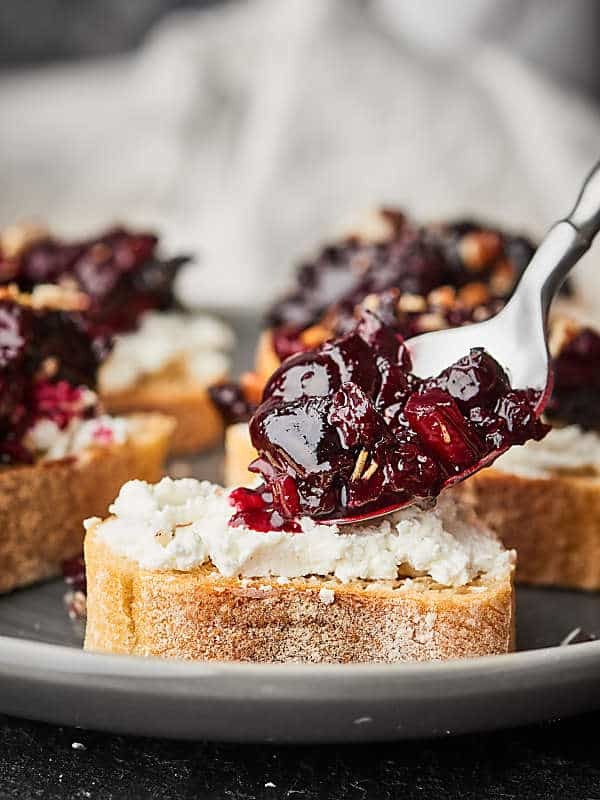 Take a slice of baguette, slather on goat cheese, and top with a spoonful of cherry compote! Thanks again to Barefoot Wine & Bubbly for sponsoring today’s post! Hahaha we’re ALWAYS twins Marina 😉 Thank you! Gosh, I feel like running to the shop to get all these ingredients so I can make it! It must taste divine! I love barefoot too!! Always a wine for any occasion. This bruschetta is going to be a party winner. Love the herbs in there. It really looks amazing, I love that glossy look! These flavors look fantastic! So elegant too! 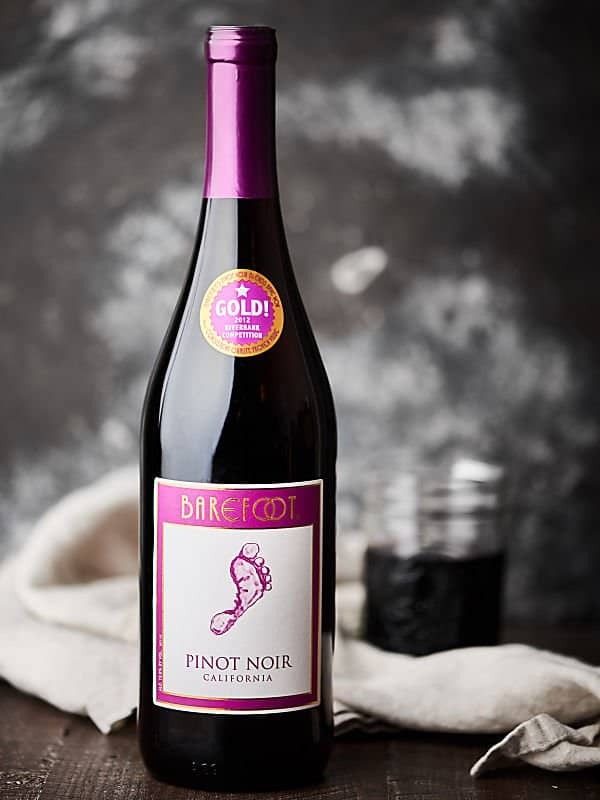 There was a period in my life where I existed solely on Barefoot’s Pinot Noir . . . who are we kidding? That time is now. You guys! Two things. One. YOUR PHOTOS OF THIS POST KILL ME! Two. This is the appetizer of my dreams! It has me drooling! It will be made so many times over the next few months! I’m such a fan of pinot noir!! This bruschetta looks DREAMY!!! This is making my heart go pitter patter! LOVE the addition of the red wine. It makes it so fun and festive! Holy yum!!! That looks and sounds absolutely amazing! I love goat cheese, but I never buy it. Time to change that for sure!!! Been looking for an appetizer for Thanksgiving and this looks perfect! I know my family will really enjoy this. Thanks so much for sharing. This Cherry Bruschetta recipe is incredible! I made this for the super bowl party and it was a crowd favorite ! Thx a lot for sharing, Trevor and Jennifer!